Home/Trading Platforms/SAMCO STAR/What is my STAR Back office password? How to change back office password? SAMCO Star Back office is a one of the most advance back office which SAMCO provides to its clients. You can check all your trading and demat related information in your back office. Right from Trade book summary to Indian trading league rankings, Ledger, PNL statement, Demat Holdings, Referral etc. 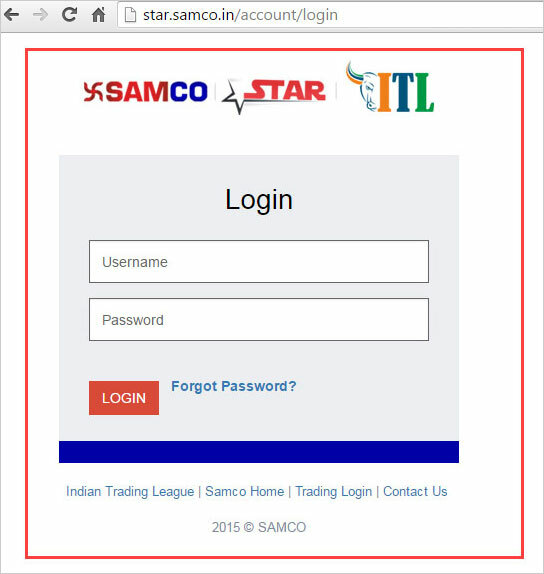 To login to your SAMCO Star back office Visit star.samco.in. Your SAMCO Star back office password is by default your PAN. for example if your client id is DX1111 and your PAN is ABCDE1234F, your back office login Id would be DX1111 and your password would be ABCDW1234F . My email id does not link with RA30970, unable to change my password. Dear Mr. Kamlesh, thank you for getting in touch with us. To reset your back-office password, please visit star.samco.in website and click on the ‘forgot password’ option. Enter your User ID and your PAN details. The system shall send you a new password on your registered mail. Use this password once and then reset your password as you wish. As for your request to change bank details, you need to send a physical form with the required documents. You may find the form in your back-office page. Kindly follow the below-mentioned steps. We hope this resolves your query. If you have any more queries or issues, feel free to contact us; we’re happy to help you. Thank you for your valuable time. Have a great day ahead!